G-20 confirmed Tuesday the there is No need to regulate Cryptocurrencies right now. 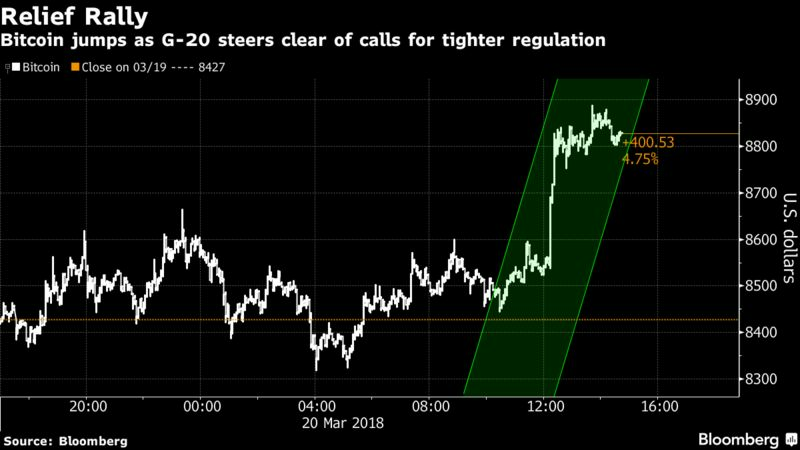 Bitcoin is rallying, the Group of 20 (G-20) finance ministers do not call for a clampdown on the volatile cryptocurrency market. Bitcoin, largest digital currency by market cap rose 5.5% to $8,889 after hanging between 8,400 and 8,600 Monday and overnight, and bouncing a 1-month low Monday. Currently, Bitcoin is trading at: 8,958.77, +335.68 or +3.8928%, as of 11:21p GMT, the market is open. Bitcoin is down more than 50% from its all-time high of nearly $20,000 in December. The G-20 did acknowledge the risk of cryptocurrencies, investors traders are pleased that the nations finance ministers did not call for tighter regulation, essentially ignoring the coins. Investor were somewhat concerned about a coordinated clampdown after a spokesman for the G-20 finance ministers said they would discuss how to approach to cryptocurrencies at their meeting in Buenos Aires on Monday and Tuesday, the concern seems to have been merit-less . The G-20 set a July deadline to decide on cryptocurrency steps, without being more specific. We can assume then that the nation’s finance ministers are looking at cryptocurrencies.